My goal is to publish new posts twice a week — Mondays and Thursdays. However, if you don’t see a new post on Thursday, it’s because I was too busy, so please look for a new one the following Monday. This Thursday’s post will be about the big and important Original Miami Beach Antique Show, which opens this Thursday at the Miami Beach Convention Center. I’m writing this blog at 4:00 PM on Sunday, an hour before the show is to close. It’s been a tough few days, mostly because of the boredom. Sales have been few, but OK, so we’ll wind up earning a bit after all is said and done. 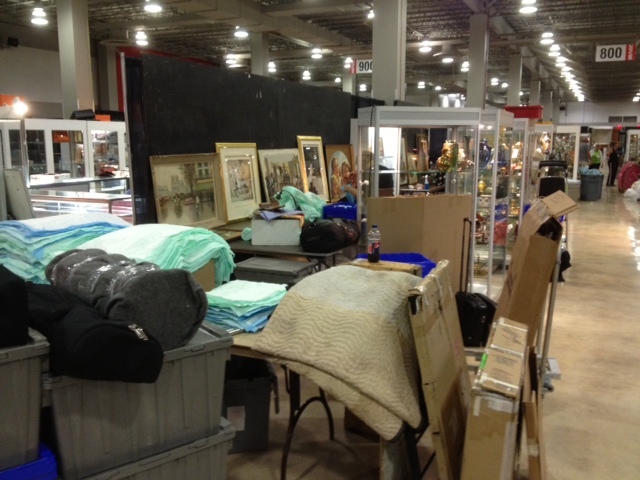 And you thought it was so glamorous to be an antiques dealer and exhibit at shows. At times, it is. When a show is busy and sales are steady, it’s gratifying. Sometimes a famous person will come into the booth and that’s fun, but mostly it’s boredom and tension. When you’re in business, you’ve got to keep selling to generate cash flow. My favorite bumper sticker says, “Happiness is positive cash flow”. The show opened on Friday with a brief flurry of people. Attendance was fairly light all day and then dropped off precipitously in the late afternoon. The show was open until 8 PM, so that people could come after work. That was the theory, but in practice, it was dead, late in the day, and the show should have closed at least an hour earlier. What is the sense of keeping open for nobody? Pretty much the same story for Saturday — light attendance and then a precipitous drop late in the day. The show was open until 7 PM and should have closed at 6 PM. People have better things to do on Saturday night than attend an antiques show. That’s the reality. Attendance on Sunday picked up a bit. I would call it moderate. There were more questions and more interest, but a tough crowd. The day ended with no sales. In asking around, a couple of dealers did poorly, a few dealers did OK. One dealer told me he did well. We’re looking forward to this week’s Miami Beach show. Clients fly in from all over the United States and the world. The excitement level goes up several notches and the action follows. It’s usually one of the best shows of the year. If you decide to visit only one of the Florida shows, make sure it’s this one! You’ll thank me. 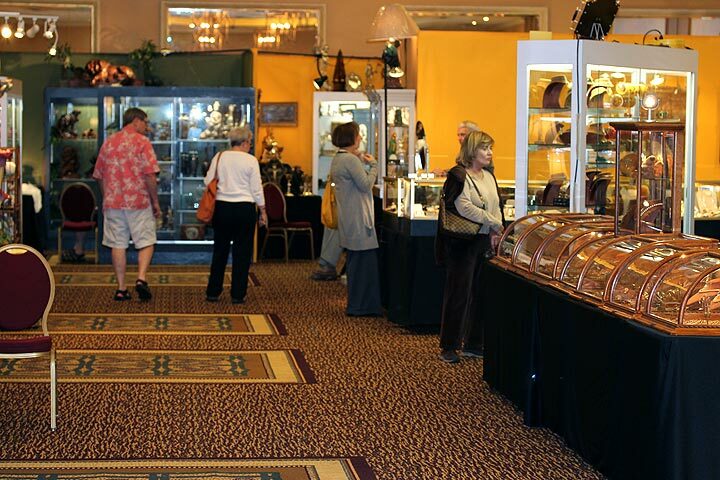 It’s huge and filled with the best dealers and a fabulous array of merchandise that you won’t find anywhere else. The big bonus is the weather. The temperature has been in the 70s and 80s every day. No more excuses! Make your plans now. Is this Daum creamer fantastic or what? Just in. My goal is to publish new posts twice a week — Mondays and Thursdays. However, if you don’t see a new post on Thursday, it’s because I was too busy, so please look for a new one the following Monday. Monday’s post will be about the results of the Miami National Antiques Show. 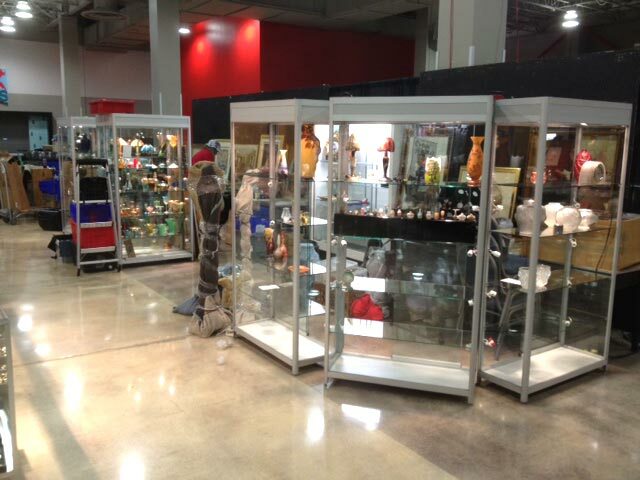 The Miami National Antiques Show started setting up yesterday and continues setting up until 5 PM today. By tomorrow, there will be a dazzling display at the opening of the show, which opens to the public on Friday, January 27th at noon and continues until Sunday, January 29th at 5 PM. 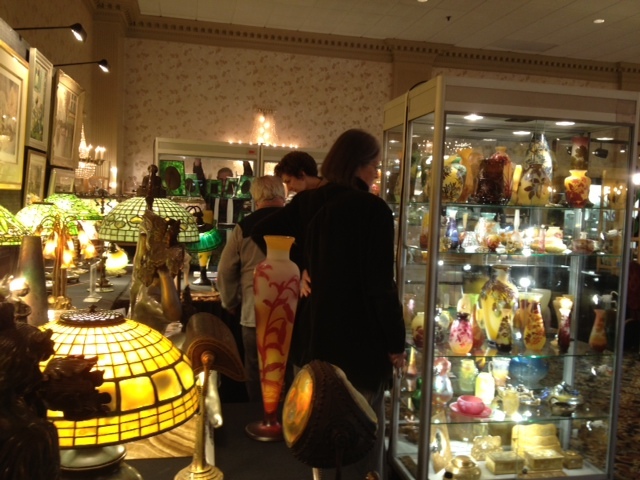 Although the show is smaller than it used to be, it still has high-powered exhibitors with spectacular items for sale. 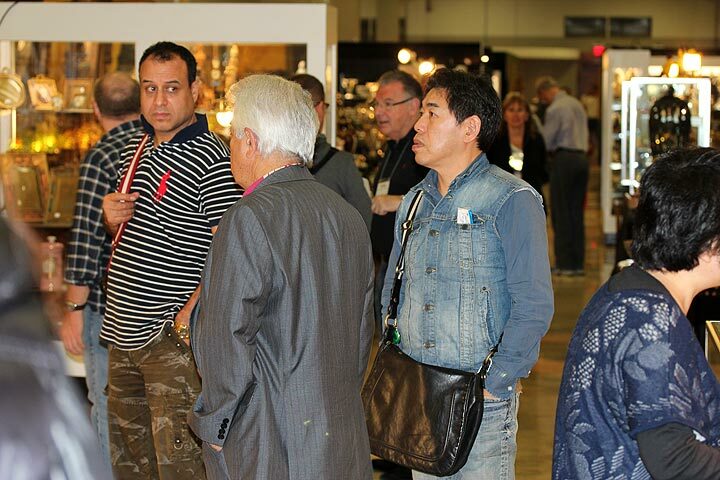 Many of the dealers will go on to exhibit at the Miami Beach Convention Center Show next week, but not all. A visit to this show is a great way to get first crack at many of the items that will be for sale next week. You’ll like what you see. The third show of our Florida circuit starts next Thursday, February 2nd, with the important Miami Beach Convention Center Show. If you decide to visit only one of the Florida shows, make sure it’s this one! You’ll thank me. It’s huge and filled with the best dealers and a fabulous array of merchandise that you won’t find anywhere else. The big bonus is the weather. The temperature has been in the 70s and 80s every day. No more excuses! Make your plans now. My goal is to publish new posts twice a week — Mondays and Thursdays. However, if you don’t see a new post on Thursday, it’s because I was too busy, so please look for a new one the following Monday. 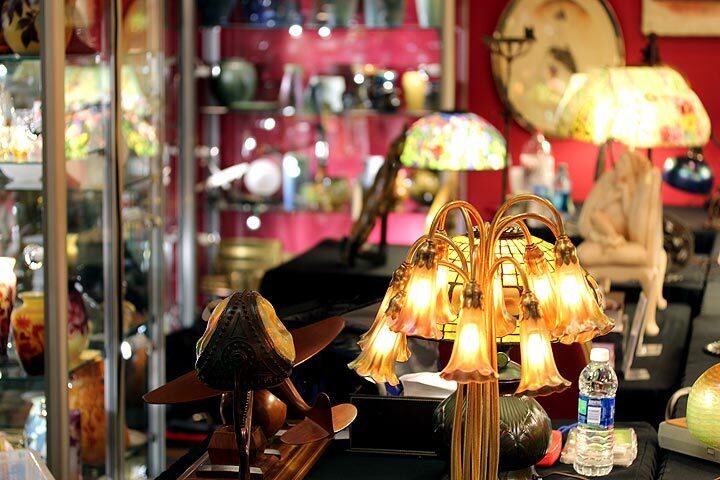 There will be a post this Thursday about this week’s Miami National Antiques Show. I thought it might be interesting if I gave you a contemporaneous blow by blow description of the Palm Beach Winter Antiques Show as it progresses. Here goes. Friday, 1:00 PM. The show opened at 11 AM and I’m already crawling out of my skin. The show is off to a slow start, with very light attendance. Those few people who came to the booth never even asked to see a single item in the showcases. Sold one good item at the preview party last night, but to the dealer in the next booth. There were very few people at the party and not one serious buyer among them. Friday, 3:05 PM. Attendance is still very light. No serious questions. One small sale to another dealer on the floor. Played 4 games of Spider Solitaire and 10 games of Words with Friends (I’m winning many of them). Now I’m off for a walk because my rear end is flat. Friday, 5:20 PM. There are very few buyers walking around and no questions about anything. Just doing busywork (like writing my blog). Luckily, I have a free wifi connection from the hotel. Friday, 6:45 PM. The ballroom is almost empty, so we’ll leave five minutes early. I need a drink! Saturday, 1:00 PM. The show started off very slowly today, but the attendance has picked up a bit. I actually showed a few items to different people. They seemed more than a little reluctant, but definitely interested. Saturday, 1:40 PM. Finally broke the ice to the public — made a small sale to a lovely older couple. Saturday, 3:55 PM. Busy for a while. 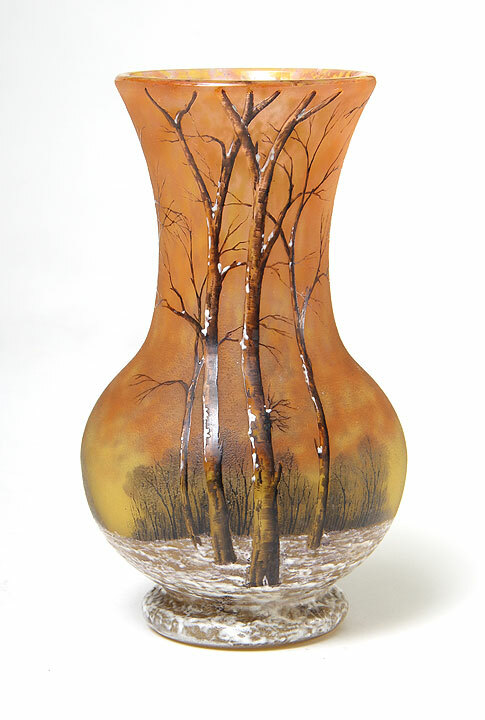 A few bona fide customers inquired about various vases, but no dice. A gentleman brought in some French cameo glass vases that I wound up buying. Made another sale to a dealer on the floor. Three of my four sales have been to dealers at the show. Saturday 6:20 PM. There isn’t a single client walking around, so we’ll leave a little early. The show never should run to 7 PM on a Saturday night. It should have ended at 6 PM. Sunday, 1:15 PM. I dropped Lia off at the show earlier and left to buy lunch and find a portable TV to watch the NY Giants defeat the 49ers. Did you know they’re nearly impossible to buy in a store? First I went to Walmart, then Brandsmart, then Best Buy. Finally the Best Buy salesman said he had a couple for sale in the trunk of his car. So I bought one — I hope it didn’t fall off the back of a truck. He assured me it hadn’t. Attendance is still slow, but there have been a few questions. We’ll see if any of them turn into sales. Sunday, 4:10 PM. One of our clients showed up — a lovely lady. 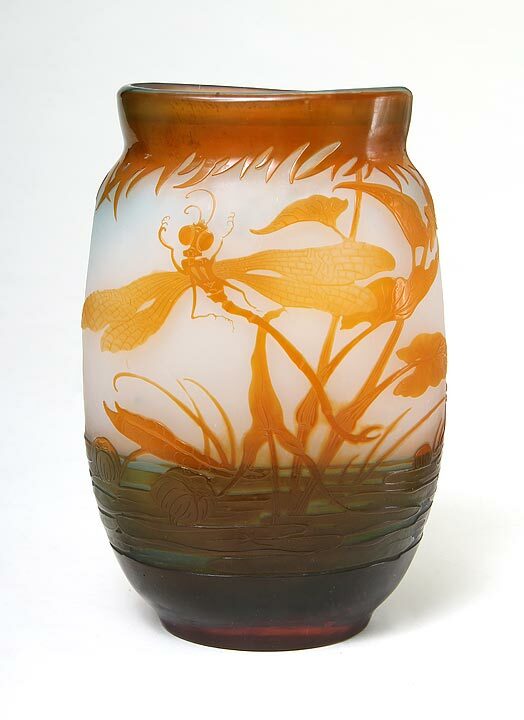 She purchased several of the rarer Tiffany Studios desk pieces, so we are ending the show on a positive note. In 50 minutes, we’ll start packing up and get ready for the next one. After all the bother with the portable TV, it didn’t work in the building. The signal was too weak and only worked outside. I called the salesman who sold it to me and he agreed to take it back. Sunday, 8:05 PM. ESPN.com showed the results in a timely fashion, but no voice or video. The NY Giants finished the first half ahead 10-7 (Go Giants!). We finished packing and now I can go to the hotel bar and watch the second half. Did I say Go Giants? The show was disappointing, but far from a disaster. Attendance was much lighter than I had hoped, as was interest and sales. I didn’t add everything up, but either we broke even or made a ham sandwich. That’s a lot of work for a ham sandwich. Will we do the show again? Doubtful. There’s a Pier Show in New York at the same time, with significantly lower costs for us. We could stay home in New York for an extra week and then travel to Florida for three shows, instead of four. That’s probably what we’ll wind up doing next year, but that could change. 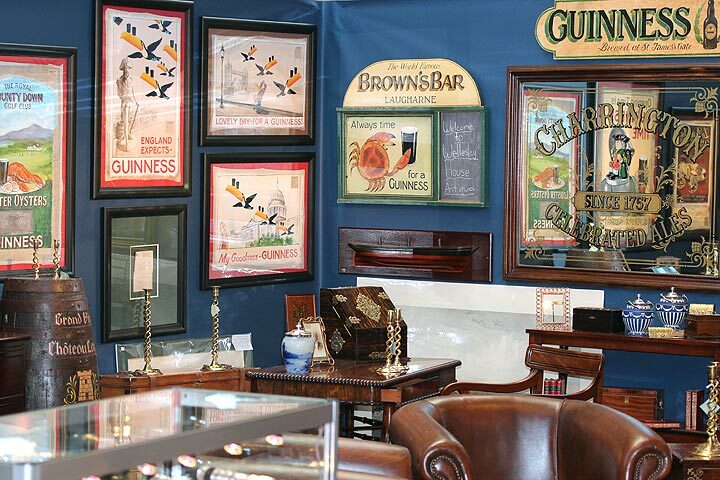 The second show of our Florida circuit starts this Friday, January 27th, with the Miami National Antiques Show (aka The Airport Show), at the Doubletree Expo Centre, Miami Merchandise Mart, in Miami. Make your plans to visit us at any of our Florida shows. 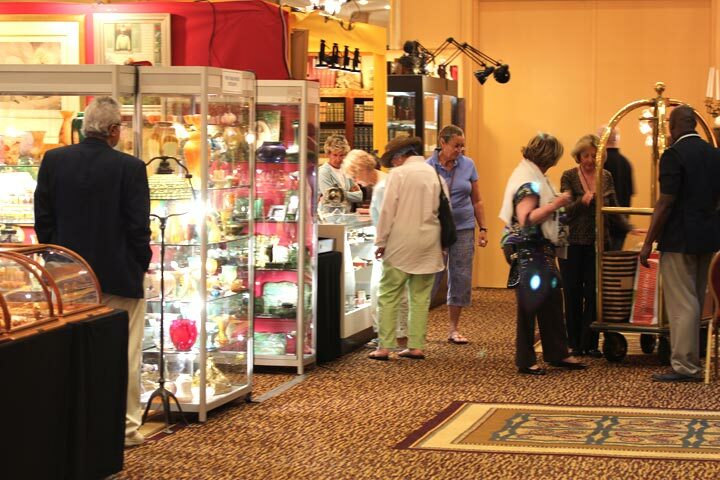 They’re filled with the best dealers and a fabulous array of merchandise that you won’t find anywhere else. The big bonus is the weather. The temperature has been in the 70s and 80s every day (while it’s 10 degrees in Chicago, as I write this). No more excuses! Make your plans now. My goal is to publish new posts twice a week — Mondays and Thursdays. However, if you don’t see a new post on Thursday, it’s because I was too busy, so please look for a new one the following Monday. 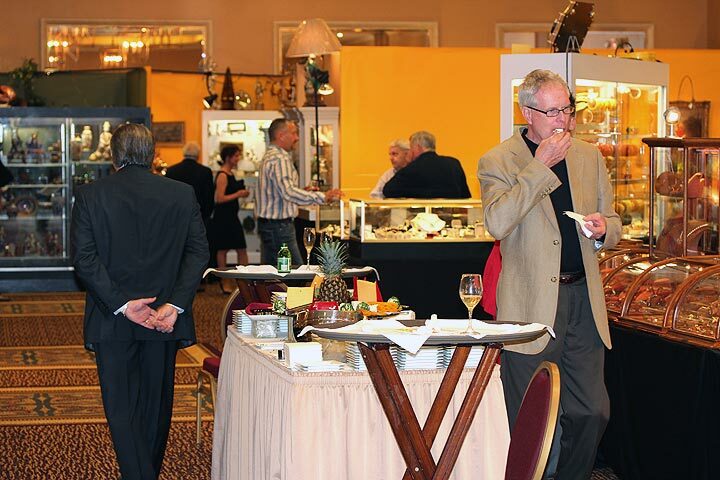 Monday’s post will be about the results of the Palm Beach Winter Antiques Show. 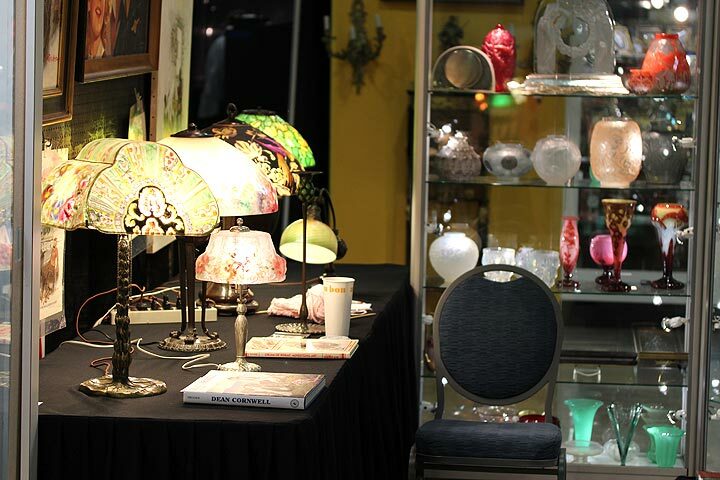 The Palm Beach Winter Antiques Show begins on Friday, January 20th, at 11 AM and ends on Sunday, January 22nd, at 5 PM. It’s Thursday night, as I write this post, and the preview party is underway. 45 minutes into the party, there are very few guests, but there is a lovely spread of different cheeses, crackers and fruit, right in front of our booth. There also are waiters circulating with wine and hors d’oeuvres. So that part of the party is quite nice. The problem is preview parties themselves. I rarely sell anything at them and I don’t expect this one to be any different. Setup went smoothly — easy entry to the ballroom and no untoward problems. The booth is very awkward because even though it’s a standard 10′ x 20′, it’s oriented the wrong way, with the smaller measurement to the front. But there is an aisle next to the booth, so people can enter from the front or the side. The booth looks great, with a carpeted ballroom setting being especially conducive to setting up and hopefully to selling too. We haven’t exhibited at this show before, but in speaking to some of the dealers who’ve been here before, the general quality of the show has gone up since the new promoter, Rosemary Krieger, of Dolphin Promotions, has taken over this year. The show is high quality and the public should be very pleased with the varied and powerful offerings. The results will be in by Sunday night and I’ll post them on Monday. Tune in again. 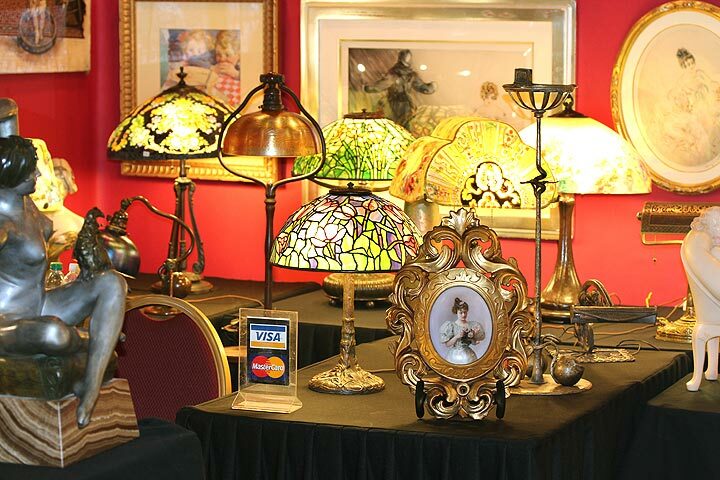 The second show of our Florida show circuit starts next Friday, January 27th, with the Miami National Antiques Show (aka The Airport Show), at the Doubletree Expo Centre, Miami Merchandise Mart, in Miami. Make your plans to visit us at any of our Florida shows. They’re filled with the best dealers and a fabulous array of merchandise that you won’t find anywhere else. The big bonus is the weather. The temperature has been in the 70s every day (and 10 degrees in Chicago as I write this). No more excuses! Make your plans now. My goal is to publish new posts twice a week — Mondays and Thursdays. However, if you don’t see a new post on Thursday, it’s because I was too busy, so please look for a new one the following Monday. There will be a Friday post this week, a day later than usual. We just returned from a brief business trip to Paris and luckily had time to visit our favorite museum in the world (at least as of today). 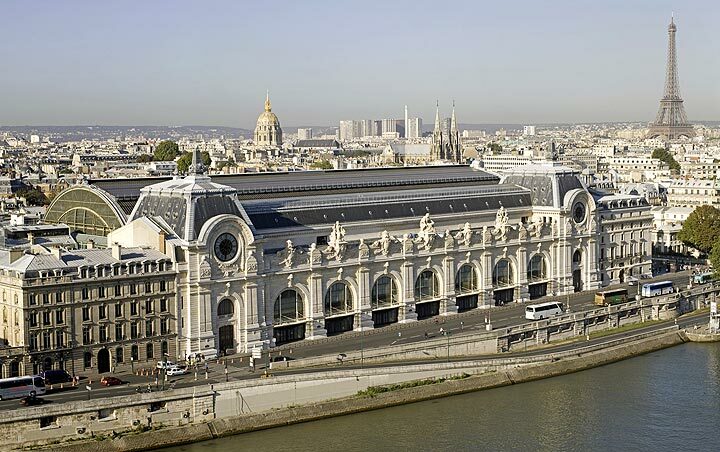 The Musée D’Orsay is located in what used to be a railway station, the Gare D’Orsay. The beautiful Beaux-Arts building was transformed over a nine year period from 1977 to 1986, after being saved from the wrecking ball by receiving landmark status. The result is a spectacular museum, both from the perspective of its architecture and its collections. 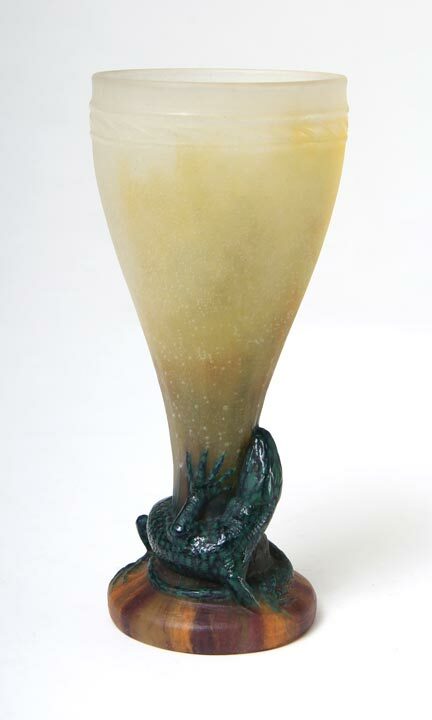 The Art Nouveau collection includes furniture, glass and ceramics, with some truly incredible objects. 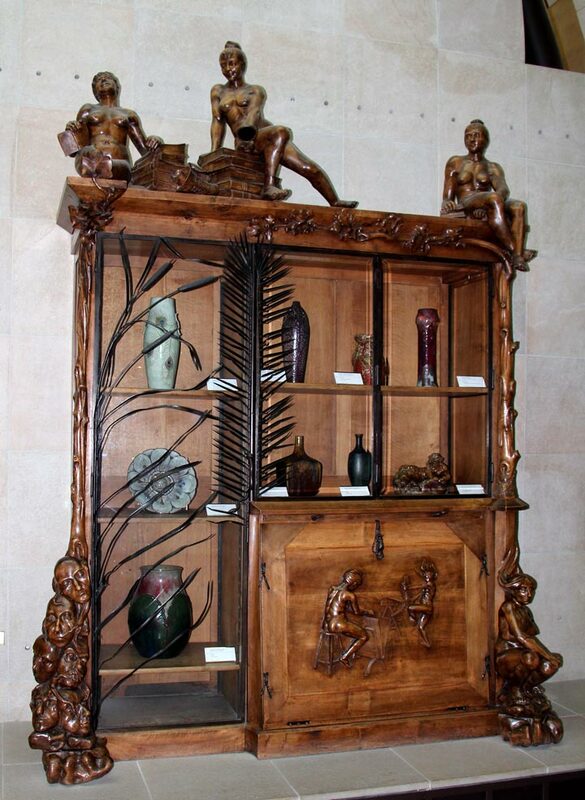 One of my favorites is a wonderful hand-carved wood library by the great French sculptor, François-Rupert Carabin. 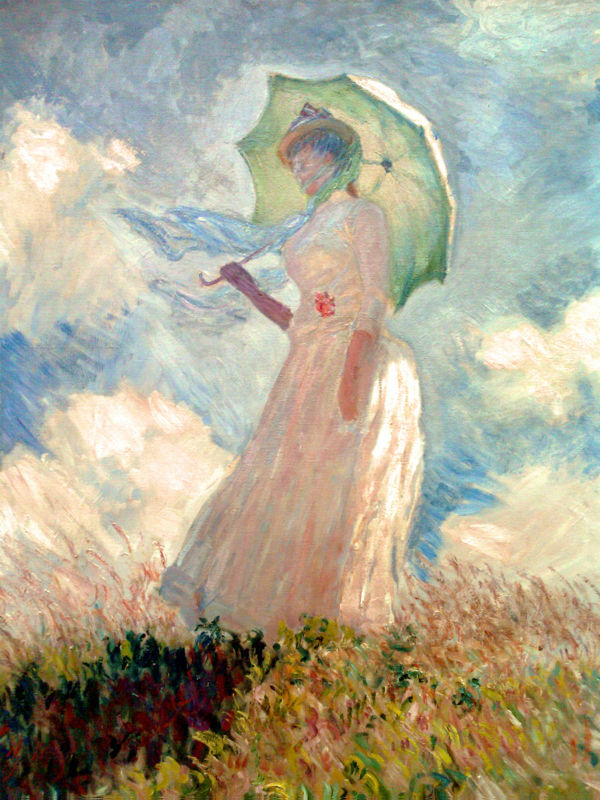 The museum has a vast collection of French Impressionist paintings by Monet, Manet, Renoir, Pissarro, Degas and others. If you love Impressionism, as I do, you have to visit just to see the art. And don’t miss the breathtaking paintings by James Tissot — wow! 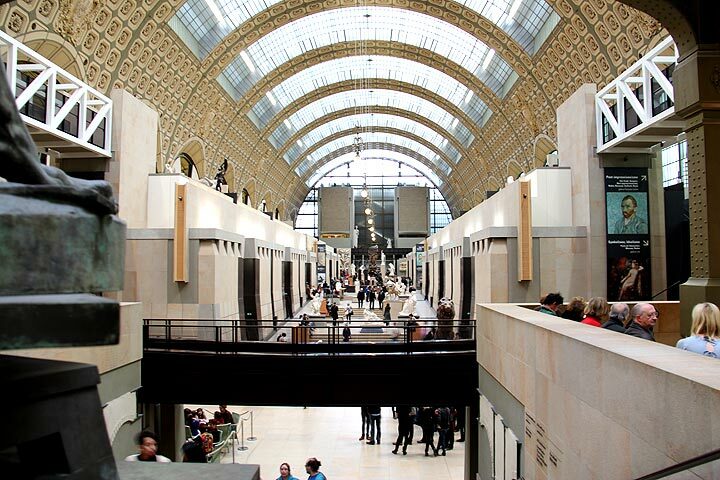 Convinced yet to visit Paris and the Musée D’Orsay? It’s closed on Mondays, otherwise open every day, including late on Thursday. Spend several hours and have a really great time! 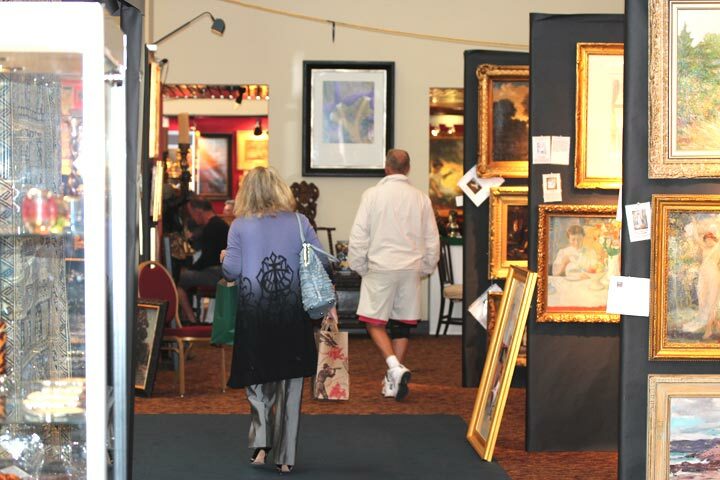 The first show of our Florida show circuit starts this Friday, January 20th, with the Palm Beach Winter Antiques Show, at the Embassy Suites (formerly Crowne Plaza), 1601 Belvedere Road in West Palm Beach. Make your plans to visit us at this show or one of our other Florida shows. They’re filled with the best dealers and a fabulous array of merchandise that you won’t find anywhere else. The big bonus is the weather. The temperature has been in the 70s every day. My goal is to publish new posts twice a week — Mondays and Thursdays. However, if you don’t see a new post on Thursday, it’s because I was too busy, so please look for a new one the following Monday. There will not be a Thursday post this week because I’ll be traveling to Europe on a quick buying trip. I hope to return with a few choice items, which I’ll display at my upcoming Florida shows. 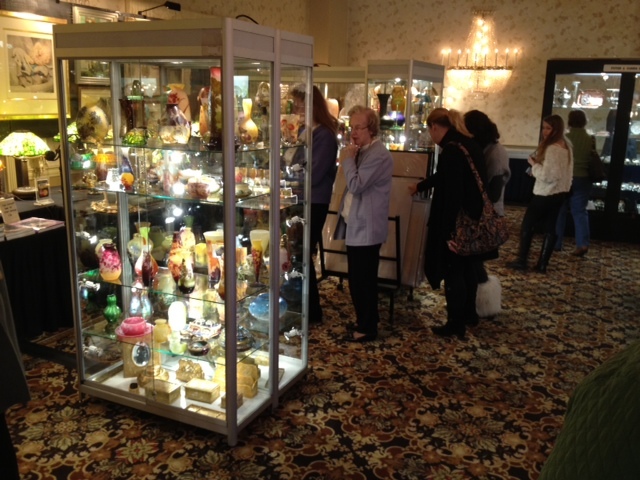 The Birchwood Manor Antiques Show was held in Whippany, NJ, this past weekend, January 7-8, 2012. The show was shortened from a three-day show to a two-day show, based on my suggestion last year to the show promoter, Allison Kohler. Two-day shows have worked great for Stella’s Pier Show in Manhattan, so why not for Birchwood Manor in New Jersey? Here’s the way I see it. When a show is only two days long, more people attend per day. That makes for more energy — like critical mass in a nuclear reaction. Another big plus is that the time commitment for dealers (and the promoter and the rest of the staff) is one day shorter, and that’s a big deal. Everyone wins — the public gets to see the same show; the promoter sells the same number of tickets to the public; the dealers sell the same (or more) with one fewer day. How can you beat that? So now that you know the theory, how did it work in practice? Very well, thank you. Attendance was fairly good both days, although a little slower on Sunday, perhaps because of the Giants playoff game. (Go Giants!) Because the show was more crowded, there was more interest, more questions, and thank goodness, more business. I spoke to quite a few dealers. Most said they had good shows or at least passable. One dealer said she had a better show than she did in Miami Beach last year (wow!) — and that’s with only 14 total hours of selling. I’d say that was a successful show. The show is smaller than it used to be, so I think some of the dealers who dropped out should reconsider and exhibit again. 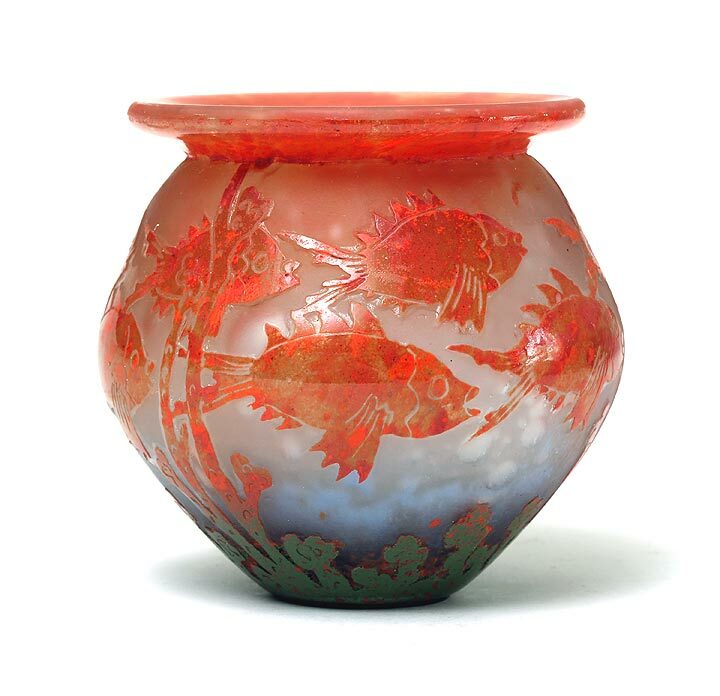 Personally my show went well, with the most interest in French glass, Tiffany lamps and bronze, Fulper pottery and French bronze. We’re looking forward to our Florida show circuit, which starts with the Palm Beach Winter Antiques Show at the Crowne Plaza Hotel in West Palm Beach on January 20th. 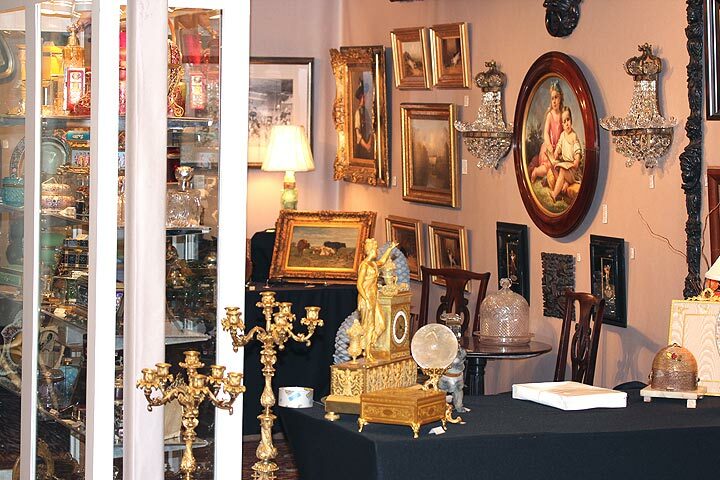 You’ve got to admit that antique dealers are not stupid — all of the action moves to Florida in the middle of the winter. By the time we get back to New York, the winter will almost be over. In the meantime, I suggest you make your plans to visit some of the Florida shows. They’re filled with the best dealers and a fabulous array of merchandise that you won’t find anyplace else. My goal is to publish new posts twice a week — Mondays and Thursdays. However, if you don’t see a new post on Thursday, it’s because I was too busy, so please look for a new one the following Monday. There will not be a Thursday post this week because we’ll be in Whippany, New Jersey setting up the Birchwood Manor Antiques Show. (Hope you can visit us this coming weekend, Saturday, January 7 – Sunday, January 8. Which reminds me to wish all of you a Happy, Healthy, and Prosperous New Year! The current exhibition at the Nassau County Museum of Art is entitled The Paintings of Louis Comfort Tiffany: Works from a Long Island Collection. To the best of my knowledge, no other museum has ever displayed such a comprehensive collection. 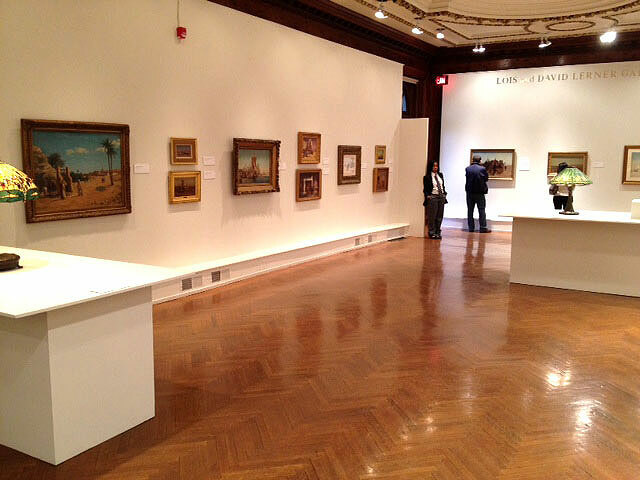 The exhibition will end on March 18, 2012, so there’s still plenty of time to visit. Make your plans to see this superb collection before it’s too late! 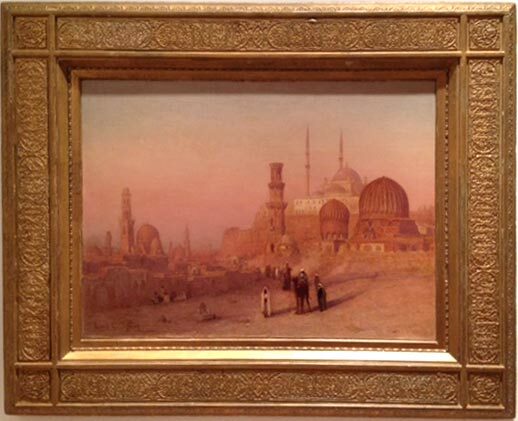 Starting in his twenties, Tiffany traveled extensively in the Middle East and Europe. His paintings illuminate his travels and serve as a wonderful record. 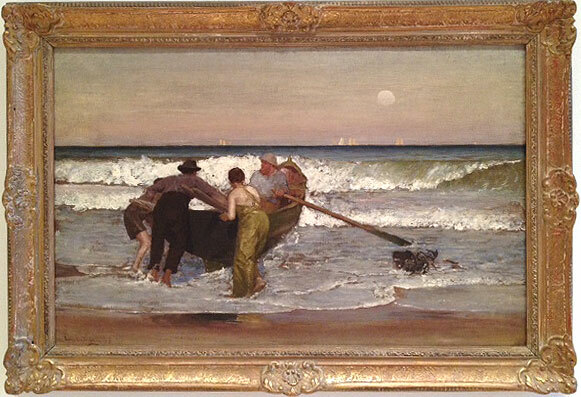 Tiffany painted Pushing Off the Boat at Sea Bright on his visit to Sea Bright, NJ in 1887. 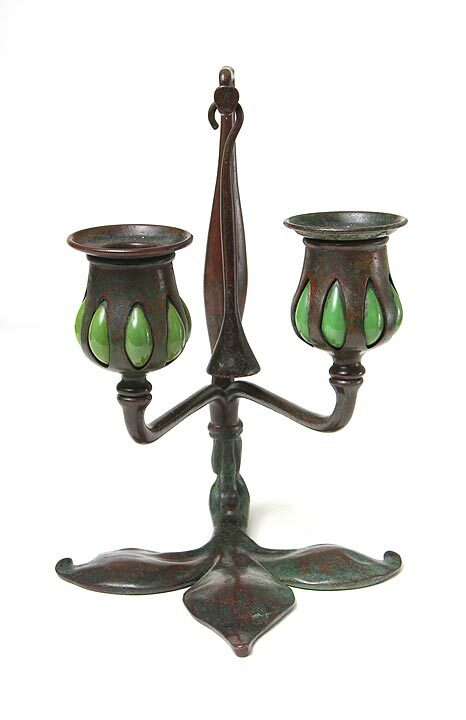 In addition to the 125 paintings and watercolors, the exhibition contains a few fine examples of windows and lamps from Tiffany Studios. Photos do not do justice to the exhibition, so run, don’t walk, to the Nassau County Museum of Art in Roslyn, Long Island, New York! 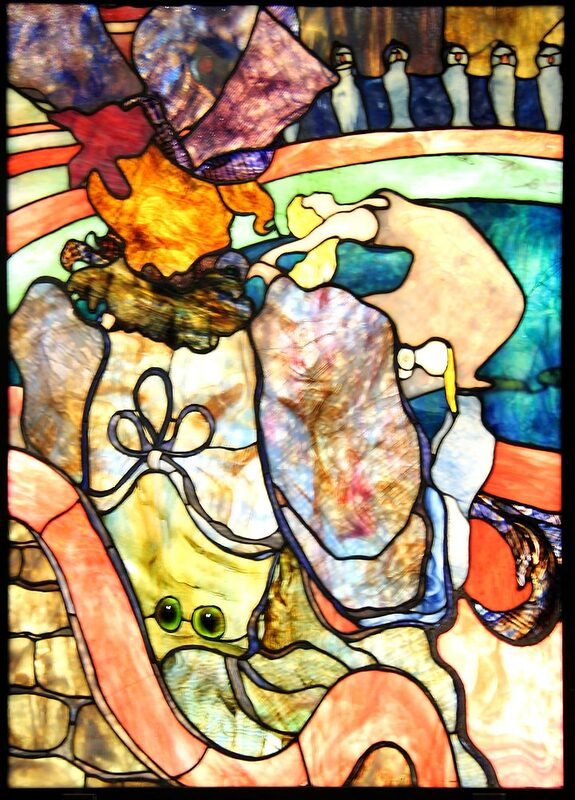 Here’s the link to the Museum’s website, Tiffany exhibition. 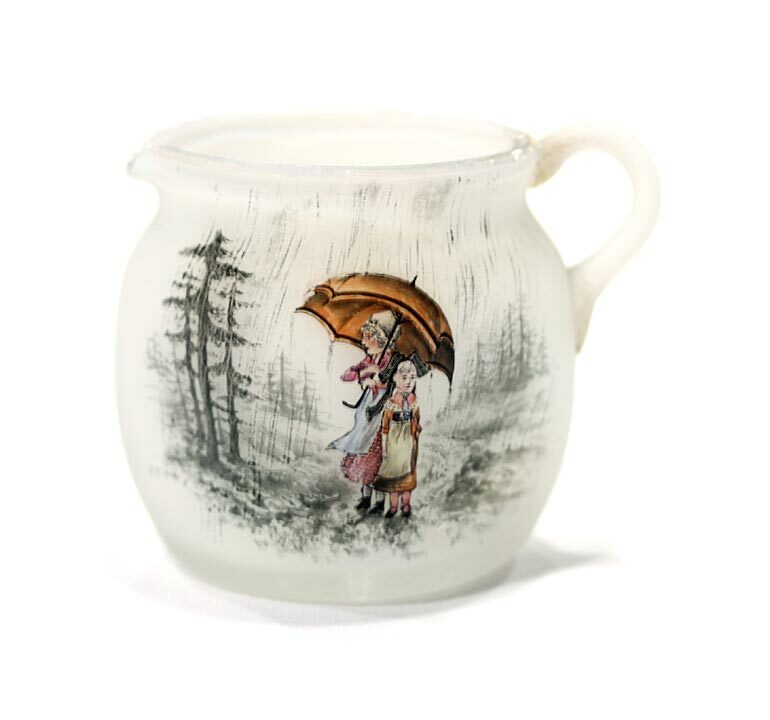 Do you have an antique you want identified? Please visit my wife's facebook group and post it.